In a clandestine corner of Germantown’s 55-acre Awbury Arboretum live eight very busy goats who, aside from being the most charming of ruminators, serve as therapists, yogis, landscapers and friends. “Do you want to hold one?” she asks me, placing 10-month-old Nigerian Dwarf goat Ivy in my arms. Krivit tells the children beside me that they can feed the goats by holding the tree’s branches out in front of them. “Like corn on the cob,” she says. Krivit, sitting in the hay, clutching Anthony, launches into a detailed description of the animal’s four-stomach digestive system. “They tear with their front teeth and the food goes into their first stomach, the rumen,” she says. The rumen, which can hold up to six gallons of matter, is responsible for breaking down plant material. Goats periodically cough up this broken down plant matter, called cud, before swallowing it again. Krivit continues, explaining that because their rumens produce so much gas, goats are pot-bellied during the day and then “fart all night” to appear thinner in the morning. Everyone laughs. My favorite kind of invitation. Sage explains most of the goats have iconic Philadelphia natives as their namesake. She named Teddy after local musician Teddy Pendergrass, a Philadelphian R&B singer and Annie and Ray after national trailblazers Ann Preston, the first female physician in the United States, and Raymond Pace Alexander, first black trial court judge. The youngest of the herd, the three 10-month-old siblings affectionately called “the littles,” she named to represent what the project aims to bring to the community. Ivy, named for poison ivy, represents eradication of unwanted and invasive plants, the ecological purpose of grazing. Anthony, named for Anthony Benezet who established the first school for black children in Germantown, reflects the social justice mission of the program. Last in the lineup, Bebito signifies the project’s dedication to the underserved communities of Germantown. Meaning “little baby boy” in Spanish, Bebito is named in memory of Jose, the beloved 21-year-old nephew of the head Awbury groundskeeper, who was shot and killed in February 2018, due to gang-related violence. Chief among the goats’ weekly activities are community goat walks, during which each goat dons a halter and leash and trots politely alongside their human walking companion. Today Sage leads the way on a jaunty, head-turning goat walk through Germantown. The group stops occasionally to trade goats with one another. The purpose of the outing is to exercise the goats and show them off to the community. The goats are well trained and walk better than most dogs on a leash, save the occasional dive toward a pile of leaves or ivy-covered wall. While the goats are not supposed to munch as they walk, sometimes they try. There aren’t many shrubs they won’t eat, though there are ones they shouldn’t, says Bob Krivit, Karen’s husband. Yew, a coniferous tree with red berries, for instance, is poisonous to goats, he says. Toward the end of the walk, the group comes to the base of a hill, where the event routinely ends in an uphill race. All eight goats and about 30 volunteers begin running, shrieking in laughter, and dropping halters as the goats dash toward a greener patch of meadow. These are working goats, not pets, in Krivit’s words—but they have a lot of fun. “I didn’t go to school to be a goat herder,” says Krivit. She and her daughter are not goat experts, but they have mentors who are, and have learned a lot in the short year this program has been in place. Krivit’s philosophy is that you don’t need prior experience to fill a need if you are willing to learn and take criticism. “As a clinician, I’ve learned you can take advice from top-notch people and work it into your practice,” she says. Sage and Krivit have done their research. The goats have been carefully chosen. Krivit describes them as a “closed herd,” and “protected biome.” Before introducing a new goat to the herd, they screen them for a disease she calls “goat herpes.” It’s really unwise to get one goat at a time because of group dynamics, she explains. They’re incredibly social animals. It’s difficult to get an uninterrupted moment with Krivit, but her volunteers are eager to share their personal stories about the goats, the Awbury Arboretum and the program developer herself. I sit in the barn with a line of volunteers waiting to talk to me. Donald Green, a towering, soft-spoken man with dreadlocks to his shoulders, started out as a volunteer. He stumbled upon the Philly Goat Project while walking around the neighborhood with his daughter Dahlia and now heads up the grazing projects. The goats are excellent at clearing overgrown areas, he says, preparing grounds for landscaping in an eco-friendly way. Green grew up in Germantown and feels his deep knowledge of the neighborhood and its diverse needs contribute to the “very localized” nature of the project. I ask Green about his relationship with the goats. He says all the goats have individual personalities. Oliver, whose full name is “Oliver Oyster-man,” can be a bully to the other goats. When Green tries to redirect him, Oliver will hold a grudge—often ignoring him until he makes amends. “He’ll give me a look like a child would give a parent,” Green says, amused. 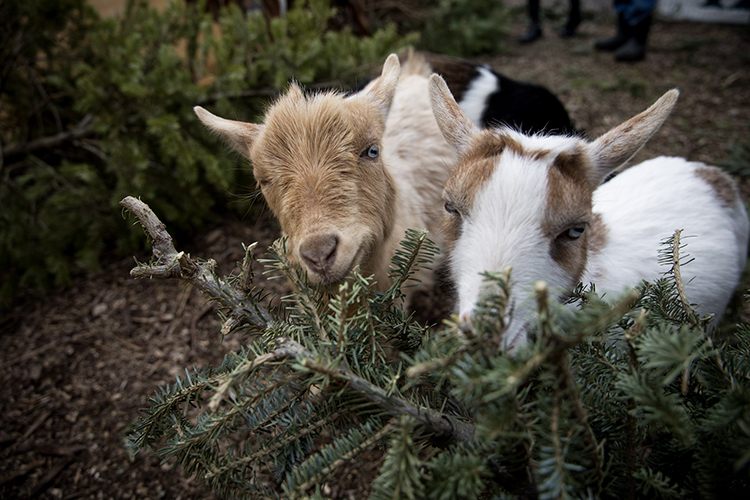 Neighborhood mom Jessica McCreary also stumbled upon the Philly Goat Project during a concert the arboretum hosted. She’s grateful to have found an intersection between farm and city life in her neighborhood. She and her kids will come to the farm to get their “goat fix,” she says, proving in the goat’s corner of the arboretum, you really can have the best of both worlds. When I’m able to coax Krivit into sitting down for a moment, she shares a chair with Sage and they wrap their arms around each other, finishing each other’s sentences. “We’re creating a platform that demonstrates generativity. What’s really magical about Philly Goat Project is its effective in all walks of life,” says Krivit. “It’s the kind of thing where you didn’t know you needed it,” Sage adds. “There are things we can’t control in terms of what’s going on … in the world,” she says. It seems she wants to say more, but she stops herself, carefully choosing to describe the project as one of compassion. People from the underserved communities in the surrounding neighborhood, bring their trauma, their sadness, and their needs and share in the social capital. “It’s a social justice platform,” Krivit says. “Awbury is all of ours,” says Sage. Sage takes over and continues to expound the mission of the project. She researches heavily, hence her encyclopedic knowledge about goats, and plans the children’s programs. She’s living in New York City, studying to become a licensed mortician, but she comes home as much as she can to help with the project. She speaks to the many rewards of the program. “Being able to learn, teach and then watch other people teach it … ” she gives a nod that fills in the blank. Krivit was a former resource specialist and licensed clinician for people with special needs and a 30-year social worker in Philadelphia. “I’m kind of famous for ‘the A-list,’ ” a resource guide for Elwyn’s special needs community, she says. She brought her prior knowledge to the Philly Goat Project, where the goats are trained as therapy goats. Every Tuesday, Pennsylvania School for the Deaf (PSD) comes to the barn to work with the goats. Most of the high-school-aged students are from the city, all are deaf or hard-of-hearing with additional needs, and have never worked with animals. The goats are learning to pay attention to signing, says Prinnie Eberle, a Philadelphia school teacher and interpreter. We go on another goat walk, this one more solemn than the first, and Eberle attests to her students’ relationships with the goats. “For them to have somebody to take care of that has more needs than they do, when they’re so used to us caring for them is empowering,” she explains. Eberle has been teaching deaf children for 45 years.The barn chores and goat walks provide creative ways for her students to develop and hone life skills, like choosing the appropriate clothing for work and deciding when to cross the street. Krivit expresses concern about some of the students once they graduate. For some, this is their only contact with nature; for others, their only form of exercise, which is why she tries to connect with their families. During the walk, we stop periodically to wait for others, to rest and to clean up goat poop. I notice Darryl, a student in a checkered button-down, kneeling next to Oonagh, his arms around her pregnant belly. He sees me watching and gives me a thumbs up, then he rests his head on her back. He’s always connected with Oonagh, says Krivit. After the walk, Eberle gathers the students and aids and asks them the same question I asked her: What do the goats do for them? Aids Brian and Hiram both agree. Not unlike your typical yoga class, goat yoga involves an instructor, mats and open space. The ambience, however, is a little different. The sound of breathing and smell of incense are replaced with bleating and farm odors and uncontrollable giggling. This yoga class meets at the historic Cliveden Carriage House. The space is enclosed with folding tables, the yoga mats arranged on top of painters’ tarps. My impression was that goat yoga was merely yoga in the presence of goats. I was surprised to learn that the goats, at least the Philly Goat Project goats, are very involved. Before we even begin, the room erupts with laughter as Ivy tries to leap onto one of the participant’s backs. As yoga instructor Dawn “Dee Renee” Vance leads us through the various poses, three volunteers lead the littles around the room. Having a 25- to 30-pound goat on your back is interesting. It’s just the right amount of pressure, and their little grippy hooves dig into your muscles. It’s fun and funny—the goats sometimes miss their target, tumbling to the ground. Laughter erupts again as Ivy poops on someone’s mat. A volunteer scrambles to get a broom and dustpan. “We do lots of child’s pose and tabletop, it’s easier for the goats to get on top of you,” Vance explains. Vance says goat yoga makes people happy, combining elements of yoga wellness and petting zoos. It decreases anxiety and depression, she says. It’s certainly true that after an hour of exuberant giggling, you feel pretty buoyant. To conclude the session, Vance encourages participants to take a moment of mindfulness.